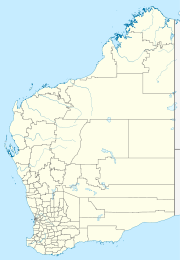 Caron is a small town located on the Mullewa-Wubin Road in the Mid West region of Western Australia. It is situated between the towns of Perenjori and Dalwallinu. The town is named after the nearby Caron Spring which is located about 26 kilometres (16 mi) to the west. Originating as a railway station along the Wongan to Mullewa line, the townsite was gazetted in 1921. The name is Aboriginal in origin, being a word for hail or hailstone. The heritage-listed Caron Coal Stage, built in the golden age of steam locomotives, and the associated railway dam are located close to the town. The stage is a simple example of an elevated concrete coal bin, constructed in 1930 or 1931 to provide fuel to the trains of the era, and is the only remaining trace of the Caron siding. The state's steam rail system often had to counteract drought and, in 1948, special trains had to haul in 910,000 litres (200,000 imperial gallons) of water to Caron, Perenjori and Buntine. ^ Western Australian Land Information Authority. "History of country town names – C". Retrieved 5 May 2011. ^ "Australia's Golden Outback - Perenjori". Retrieved 5 May 2010. ^ "Register of heritage places - Assessment documentation" (PDF). 2006. Archived from the original (PDF) on 21 September 2009. Retrieved 5 May 2010. ^ "Criteria for the Assessment of Local Heritage Places and Areas" (PDF). Heritage Council of Western Australia. 2007. p. 15 (picture). Retrieved 2011-07-05. ^ "Water by Rail". Western Mail (Perth, WA). at National Library of Australia. 19 November 1925. p. 21. Retrieved 5 July 2011. ^ "Current comment on rural matters of the moment THE PASSING PARADE". Western Mail. Perth, WA. 11 November 1948. p. 57. Retrieved 5 May 2011. This page was last edited on 31 July 2017, at 12:05 (UTC).